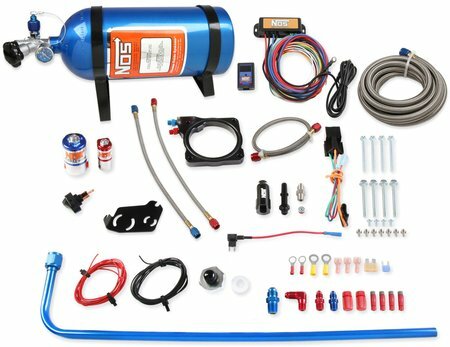 NOS is pleased to announce the release of a several new nitrous systems for GM LS engines, late model Ford and Chrysler applications, as well as dual carb (2x4) engine applications and new black nitrous bottle blankets. Sniper 80mm LS Nitrous Plate Kits deliver huge power in an efficient, economically priced package. Designed specifically for LS-powered vehicles, they provide up to 175 extra horsepower, and because additional fuel is added right though the nitrous system, no injector upgrade is necessary. 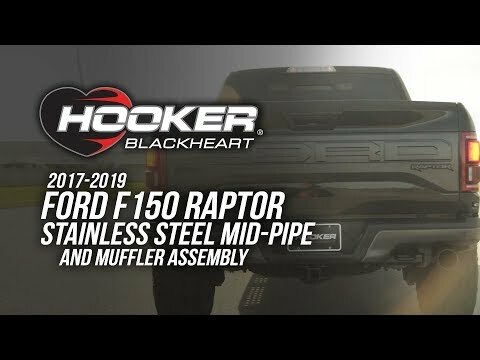 Everything you need is included in the kit: an 80mm half-inch-thick billet aluminum plate, a 10-pound nitrous bottle and the brackets for mounting it, braided stainless steel lines, jetting for an extra 100, 125, and 150 horsepower, and all the necessary hardware for a fast, easy installation. NOS Black LS Nitrous Systems are now available for both 102mm and 105mm cable-driven throttle bodies. Compatible with Holley and Sniper EFI intake manifolds, they feature a throttle body injector plate crafted from half-inch-thick billet 6061-T6 aluminum and anodized black. 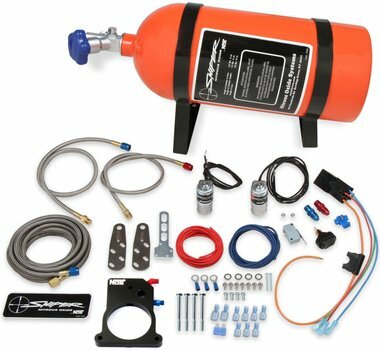 The system supports up to 250 rear-wheel horsepower and includes everything you need: a 10-pound black nitrous bottle and the brackets to mount it, black top solenoids, detailed instructions, all the necessary hardware, and jetting for 100, 125, and 150 extra horsepower. 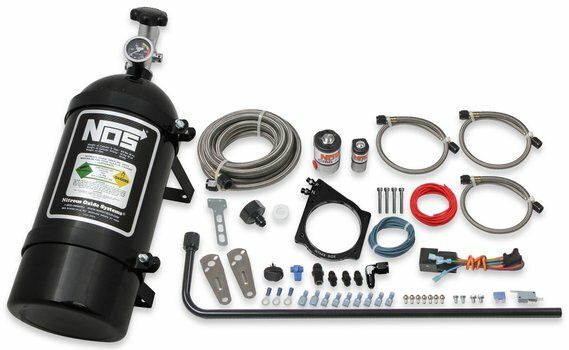 NOS Black V8 Mustang Nitrous Systems support up to 250 rear-wheel horsepower and come with jetting for an additional 75, 100, 125, and 150 horsepower. Ideal for 5.0L Coyote-powered 2011-16 Mustangs, they provide exceptionally smooth power delivery and are compatible with stock, 302 Boss, and Sniper EFI intake manifolds. 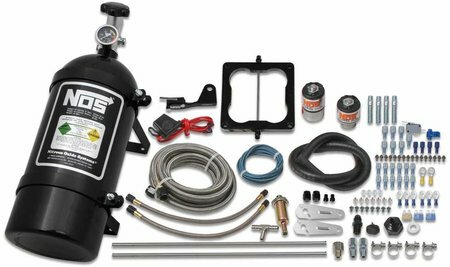 The kit comes complete with a mini two-stage progressive controller, a billet black injector plate, 10-pound black nitrous bottle and mounting brackets, stainless steel solenoid bracket, and bent hard lines for that custom-install look. NOS Black Chrysler Hemi Nitrous Systems support up to 250 rear-wheel horsepower for 5.7L and 6.1L Chrysler 300C Hemis. Perfect for Dodge Challengers, Chargers, and Magnums, these kits have everything you need: a mini two-stage progressive controller, black 10-pound nitrous bottle, 80mm black-anodized billet aluminum nitrous plate, jetting for 75, 100, 125, and 150 extra rear-wheel horsepower, custom hard lines, black-anodized aluminum solenoid bracket, and all the hardware for a fast, easy installation. NOS Black Cheater 2x4 Wet Nitrous Systems feature large nitrous and fuel solenoids that permit easy adjustment to any desired horsepower level from 150 to 250 in just seconds. Developed specifically for 350 cubic-inch and larger applications with 2x4 dual 4150-style intake manifolds, their slim half-inch billet aluminum injector plates provide ample hood clearance. These easy-to-install setups come with everything you need in one convenient package: two sets of injector plates, two fuel solenoids, two nitrous solenoids, a black 10-pound nitrous bottle, detailed instructions, and all the hardware and gaskets for a fast, easy installation. NOS Black Bottle Blankets insulate nitrous bottles, maintaining constant pressure by keeping heat in the bottle when it's cold outside and keeping the excess heat out when it's hot. Made of a rugged, easily cleaned, insulated Nylon outer shell, they blend in perfectly with other black accessories for a stealthy appearance and keep battered, battle-scarred nitrous bottles out of view. It's everything you need for Challengers, Chargers, and 300Cs in one convenient package. They're engineered specifically for 350+ cubic-inch engines with 4500-style intakes and deliver 150, 180, 210, or even 250 extra horsepower.